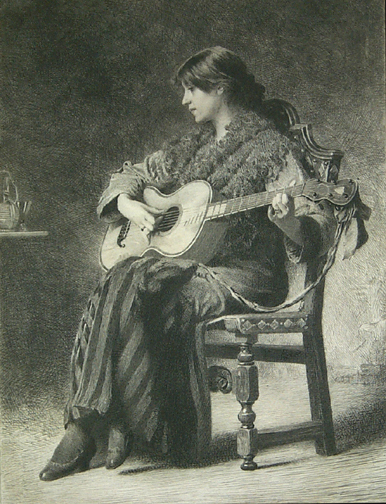 This etching of a beautiful girl playing a guitar can possibly be dated 1885-1886. There are a few details to be noted in the etching. The girl has her right hand little finger placed on the belly and she is plucking almost over the sound hole of the guitar. She obviously wants to produce a soft and mellow sound from the instrument. The thumb of her left hand is protruding above the neck. The guitar shows signs of being French and from the early or middle period of the 19th century: the moustaches, the fingerboard in level with the soundboard, the peg head with its mark in mother-of-pearl (?) in the form of a shield. The etching was made by the American bank-note and portrait engraver Stephen Alonzo Schoff (1818-1904) after a painting by Charles Sprague Pearce (1851-1914). This oil on canvas painting, which at first had the title The Guitar Player, was exhibited in 1883 at the Paris Salon. It is a full-length portrait of the artist's wife seated in a chair, playing a guitar. She has long black hair and is wearing a red shawl. The original painting is now in the estate of Dr. James E. Anliker, Elkins Park, Pennsylvania , USA. It earlier was in the estate of Lowell, Boston, Massachusetts. There is also a preparatory drawing by Pearce in the collection of the Munson Williams Proctor Institute Museum. In another letter Schoff asked for $250 total payment for the etching, but Koehler was only able to pay $200. Even with inflation taken into consideration, Schoff was paid very little for this work. He often commanded $1000 or more for his larger plates, but the etchings he did for Mr. Koehler were quite labors of love. In June of 1886 Schoff sent a note to Koehler regarding how he should go about signing a few proofs of The Prelude. These must be the prints now offered for sale by Rona Schneider. There are two copies of the etching in my collection. The first one is signed in pencil by Stephen Alonzo Schoff and printed on Japan paper. This is a brilliant impression suggesting a very early stage and is possibly one of the proofs mentioned above. The other etching has the text under the picture: "C. Sprague Pearce pinxt S.A. Schoff sculpt". This text is lacking on the first etching. This etching probably comes from a copy of American Art. The title of the etching is "The Prelude". According to Virtual American Biographies, "Prelude," also was etched by Los Rios (1883). The etching was published in Magazine of Art, probably in Washington by the American Federation of Arts. Schoff studied in Paris from 1839 to 1841 and worked primarily in New England and New York. Schoff made etchings after paintings by his American contemporaries such as William Morris Hunt. His collection of prints, now in the Smithsonian Institution, comprises more than 600 European and American prints, for example Turner landscapes and Van Dyck portraits along with his own work. I'm grateful to Jonathan Small and Richard Long who have supplied valuable information about the etching. I'm also grateful to Rosa Schneider Fine Prints for providing other valuable information as well as the original print signed by Schoff. This etching has also been used as a cover to Brigitte Zaczek's CD-record Romantische Gitarre and as cover picture to the catalogue of Chanterelle editions 2001.